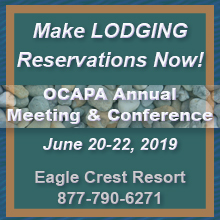 Save the dates: OCAPA's Annual Meeting & Conference is June 20-22, 2019 at Eagle Crest Resort in Redmond, Oregon. Registration forms will be available in mid-May, 2019. Call Eagle Crest Resort at 877-790-6271 to make early reservations! You must call and ask for the OCAPA Rate as their online calendar will show no availability for June 19-22, 2019. The OCAPA Officers and Board Members pictured above attended the 51st Annual Meeting and started their new term of service July 1, 2018. See the complete 2018-19 OCAPA Board. 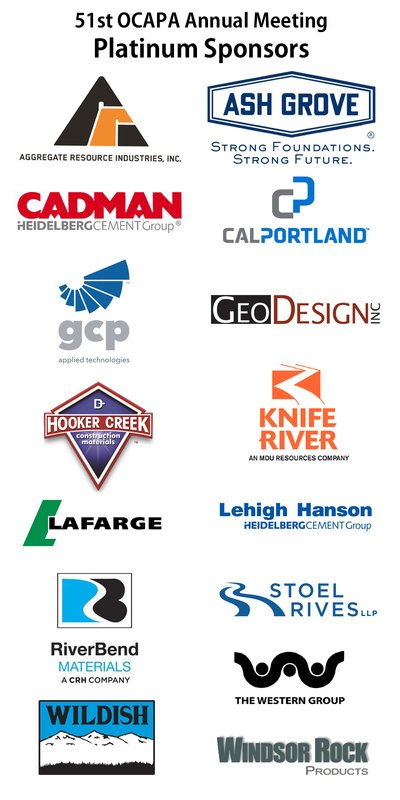 The 2018 Annual Meeting and Conference was held June 21-23 at Eagle Crest Resort in Redmond, Oregon. DOGAMI Mined Land Reclamation Awards for 2017; presented June 21, 2018. Special Recognition Award: Randall S. Hledik, Wildish Sand & Gravel Co. Lifetime Achievement: Jim Wildish - Wildish Land Co.